· Are your clothes taking more than one cycle to dry? · Do you smell something burning when the dryer is running? · Do you have condensation on the inside of your dryer door? or back of the dryer that you have to clean often? If so, these are all signs that you must have your dryer vent cleaned! Dryer Vent Professionals is a owner operated business serving Palm Beach, Martin & St. Lucie counties. With several years of experience Dryer Vent Professionals looks forward to tackling any problems you may encounter with your dryer vent or drying times. Using state of the art equiptment, we test, inspect, and clean your dryer vent to ensure the proper maximum airflow your dryer can posses. Here at Dryer Vent Professionals we take pride in our work and look forward to making you safe and happy! Dryer Vent Cleaning is a simple solution to many common problems. You may want to consider having one of Dryer Vent Professionals technicians out to provide an inspection of your dryer vent to determine if the service should be performed. Drying times that surpass 35-40 minutes, clothes that are abnormally damp to the touch after drying, and a backdraft damper flap that does not open during a dryer’s operation are all indicators that a dryer vent should be cleaned. · According to the U.S. Fire Administration there is an estimated 15,600 dryer fires annually with 15 deaths and over 400 injuries. · U.S. Consumer Product Safety Commission recommends cleaning your dryer vent annually to prevent lint blockage that may cause a fire. · According to the Association of Home Appliance Manufacturers your dryer needs maintenance like any other appliance. In order to keep sufficient airflow around the heating source, lint must be removed from the dryer and vent. · The proper type, length and installation are crucial to maintaining the proper airflow recommended by manufacturers. 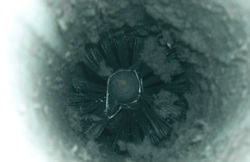 · Dryer vents clogged with lint cost $16 to $25 more per month. Using specially manufactured commercial grade cleaning tools, we will clean each vent of lint blockage and debris it may posses inside the dryer vent. Our brushes scrub the sides of the vent losening up the lint as well as wax left over from dryer sheets that may collect lint.